Does iphone 6s support wmv videos?... Why can't my iPhone 6S play videos in MP4 with a 2160P resolution? Thought MP4 is a commonly-accepted foramt. The iPhone 6S and coming iPhone 7, as iPhones always do, will irresistibly attract customers to come flocking. But when it comes to play movies or videos on iPhone 6S/6S Plus/7, customers will inevitably meet iPhone video format incompatibility problem. To ensure trouble-free video playback on iPhone 6S or 7, you are suggested to have a detailed look at iPhone 6S supported video formats, so as to avoid spending hours transferring media files to iPhone 6S/7 only end up in getting an error message. MacX MediaTrans - One click to transfer SD/HD/4K videos to iPhone 6S/6S Plus/7 at world's fastest speed and no quality loss, not confined to iPhone formats like MP4, MOV, but also MKV, M2TS, MOD, WMV, AVI, FLV etc. 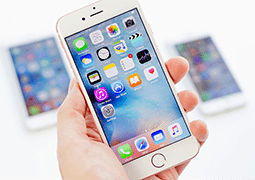 Why You Have to Know the Best Audio/Video Formats for iPhone 6S(6S Plus) ? The iPhone 6 and 6 Plus have gone down well with fans so far and the new iPhone 6S(Plus) pair with a new 3D Touch pressure-sensitive display with the same size and resolution. Combined with 2GB RAM and next-gen iOS 9 and new A9, which provides 90 percent faster experience in graphical tasks, we can ensure a faster and smoother video playback on iPhone 6S/6S Plus (iPhone 7). But only a few video formats are supported on iPhone 6S; in other words, videos in formats like 4K, HD MKV, MTS, AVI etc can simply not be accepted by iPhone 6S. If you keep receiving invalid file format message when you transfer video files, check if your video is one of iPhone 6S video formats. Audio formats played by iPhone 6S: AAC (8 to 320 Kbps), Protected AAC (from iTunes Store), HE-AAC, MP3 (8 to 320 Kbps), MP3 VBR, Audible (formats 2, 3, 4, Audible Enhanced Audio, AAX, and AAX+), Apple Lossless, AIFF, and WAV. This is the highest quality video audio files an iPhone 6S/Plus can play. Not all videos available are recognized by iPhone 6S(6S Plus)/7, like HD MKV, MTS, AVI, FLV, WMV etc. And in some cases even the MP4, MOV format videos which it claims to support can not be played on iPhone 6S due to different codecs. So how to play HD movies on iPhone 6S/ 7? How to convert MP4 to MP3 for iPhone 6S? Well, you just need a iPhone video converter to convert the incompatible videos into iPhone 6S supported ones first. To that end, MacX Video Converter Pro is recommended as your first aid. As an expert in video converting, this video converter can convert HD and SD videos like MKV, M2TS, AVCHD, AVI, MPEG, WMV etc to not only MOV, MP4, AAC, MP3 that iPhone accepts, but also directly transfer these media files to iPhone, iPad, Android and other mobiles if you don’t want to bother with formats staff. Learn how to play incompatible videos on iPhone 6S/7 below. 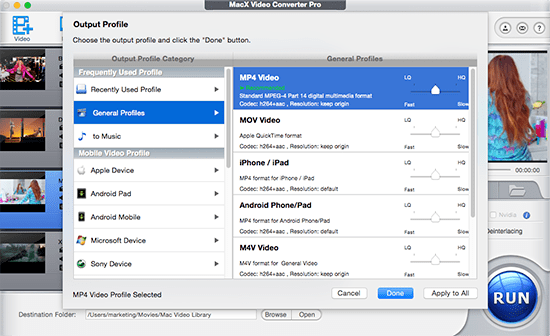 You need to download MacX Video Converter Pro on your Mac or the Windows version of video converter if you are a Windows user before converting. Step 1: Run the Mac iPhone 6S(6S Plus) video converter, click "Add Files" to load the video you want to convert. Step 2: To convert videos to iPhone 6S, choose one of iPhone 6S supported video formats like MP4, MOV, or M4V. Alternatively, you can select Output Profile > Apple Device > to iPhone Video to directly choose the iPhone 6S preset profiles. Step 4: Click "RUN" button to and this iPhone 6S video converter will automatically to start converting video to iPhone 6S. Is it possible to play HD movies on iPhone 6S, like DVDs or Blu-rays? Though it's a common sense that DVDs cannot be played on any smartphones, a proper iPhone 6S DVD ripper can provide the solution. For that purpose, you can try MacX DVD Ripper Pro. This big-league DVD ripper for iPhone 6S/7 delivers excellent performance in ripping any homemade and commercial DVDs to video formats for iPhone 6S MP4, MOV as well as other needed formats like MKV, AVI, FLV, H.264 etc, or directly to a bevy of devices, including iPhone, iPad, Samsung, HTC and many more, with 100% original quality reserved. As no matter which way (download online videos or rip DVD movies) you choose to get videos/movies on your Mac or Windows, you need an extra step to move videos to your iPhone 6S/6S Plus/7. MacX MediaTrans offers a perfect solution to do so without any format issues. With the built-in auto conversion function, it enables you to automatically convert iPhone 6S unsupported formats to MP4 during the process of transferring videos from Mac to iPhone. Step 1: Free download the iPhone video transfer and launch it. Then connect your iPhone 6S/6S Plus/7 to Mac with a USB cable. Step 2: Click "Video" icon then "Add Video" button to import video of any formats from local Mac/Windows computer to iPhone 6S. Step 3: The word Convert will be shown on the thumbnails if the videos are in iPhone incompatible videos. Click Convert, it will automatically convert the videos to iPhone formats. Then click Sync to import video from Mac to iPhone 6S.